The fifth movement of Johann Sebastian Bach's Cello Suite No. 1 in G major is actually made up of two minuets, the first one in the key of G major and the second one in the key of G minor. This second minuet is one of only twelve movements in all six cello suites that don't contain chords. At the end of the movement, Menuet I is played again, this time without repeats. Published in 1902, just three years after “Maple Leaf Rag”, this marvelous display of pianistic prowess shows Scott Joplin's potential for innovation and development. Of course, all ragtime music is rhythmically charged, forward-thrusting and syncopated, but there is a particular bounce to the step of “Elite Syncopations”. The piece is marked "Not fast", but “fast” in this instance must be seen as a relative term: it is likely that in Joplin's time many pianists were playing his rags at breakneck speeds to show off their skill. It has been widely agreed that the composer's intention was that his pieces were not to be played at outlandish speeds, but in a controlled manner. “Elite Syncopations” is built, as are all of Joplin's pieces, from several tuneful strands. In the last two sections, we move from the key of F major to the key of B-flat major, never to return. This gorgeous “Frühlingslied”, or “Spring Song”, is taken from the fifth book of Felix Mendelssohn's series of lyrical piano pieces Lieder ohne Worte, or Songs without Words. This “song” was also known in England as “Camberwell Green”, being the place in London where Mendelssohn composed it while staying with the Benneckes, relatives of his wife. Telemann's seventh Fantasia for solo flute is in the majestic key of D major. The opening movement, rightly marked “Alla Francese”, has the attitude of a French overture, and sports a series of regal dotted rhythms, which are usually played in a very incisive manner. A rondeau in 3/8 time follows, which culminates in a repetition of the initial rhythmic pattern. A ternary-form Presto closes this Fantasia in worthy manner, reverting back to 4/4 time and introducing a very fast, brilliant final theme. 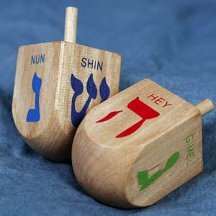 The title of this popular Hanukkah song, “Sevivon”, is Hebrew for “dreidel”, where “dreidel” is the Yiddish word for a spinning top, one of the best-known Hanukkah symbols. This tune appears to be very popular in Israel. Beethoven's Piano Sonata No. 8 in C minor, commonly known as Sonata Pathétique, was written when the composer was 27 years old, and published in 1799. Although commonly thought to be one of the few works to be named by the composer himself, it was actually named Grande sonate pathétique (to Beethoven's liking) by the publisher, who was impressed by the sonata's tragic sonorities. This sonata is one of Beethoven's most well-known works, and perhaps the earliest of Beethoven's compositions to achieve widespread and enduring popularity. It has three movements, of which the middle Adagio is arguably the most popular, opening with a famous cantabile (songful) melody. This theme is played three times, always in A-flat major, separated by two modulating episodes. The third movement of Dvořák's Symphony No. 9 “From the New World” clearly pays homage to Ludwig van Beethoven. Appropriately entitled after the “Molto vivace” (“very lively”) in Beethoven's Ninth Symphony, the first notes will make the listener feel they are suddenly listening to Beethoven all over again. Being so fast and lively, this dancing movement is a direct contrast to the Largo before it. The following “Poco sostenuto” trio in E major, on the other hand, recalls Dvorak's very strong Czech-Bohemian folk influences. Of course, Native American music had also been an influence on this symphony. In particular, Dvořák wrote that the third movement scherzo was “suggested by the scene at the feast in Hiawatha where the Indians dance“, referring to Longfellow's 1855 epic poem The Song of Hiawatha. Remained with me while I was in prison. Always maintained its sweet scent. Both names “Farinel” and “Farinelli” are used in literature to indicate the one and only 17th-century French violinist who studied with Giacomo Carissimi in Rome and subsequently went to England and Germany. This Mr Farinel is not to be confused with Farinelli, the famous Italian castrato singer of the 18th century, whose actual name was Carlo Maria Broschi. To confuse matters still more, the variations for which our Mr Farinel is now chiefly remembered are referred to as “Faronell's Ground” in The Division Flute, a collection of popular pieces published in 1704 in London. These divisions are based on the Spanish chord sequence “La Folia”, which was later made famous by Arcangelo Corelli in the variations at the end of his Op. 5 violin sonatas, published in 1700.